Fool, Magician, High Priestess, Empress, Emperor, Hierophant, Lovers, Chariot, Justice, Crone or Hermit, Wheel of Fortune, Strength, Hanged One, Death, Temperance, Devil, Tower, Star, Moon, Sun, Judgment, and World. This essay offers a new interpretation of the tarot deck, and comprises a secret order of the tarot, tracing the meaning of the cards from the heavens to hell. These are powerful images that signify important issues in your questioner's life. 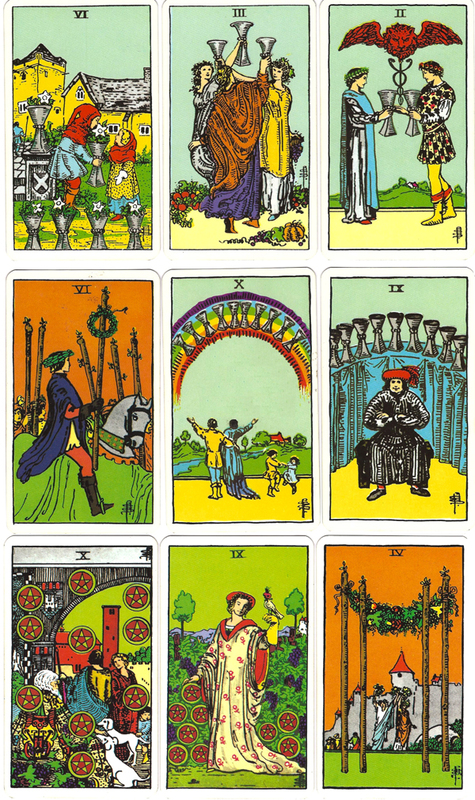 Cards of the Major Arcana also represent the strongest archetypal feelings in life. Archetypal means that these forces touch every soul in one way or another, shaping our reality. When these cards show up in a reading, it means the questioner is dealing with powerful forces that signify major life events. The Hermit and the Devil may also belong in this category, but you will find them below. The Hermit is counted as one of the Hanged Man's disciples, and the Devil is counted as one of the victims of the Tower. 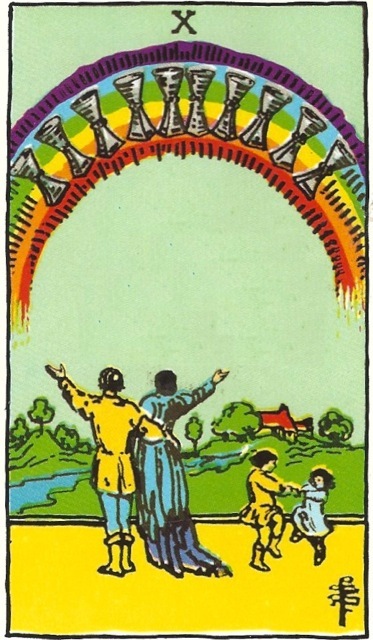 While these cards may represent the appearance of specific people in the questioner's life, more often, these symbolize forces awakening in the questioner, or dramas playing out in the questioner's life. Having an ace in a reading is an auspicious sign for the questioner. If these cards come up in a reading, they show the daily contentment the questioner experiences, which makes life good. Get to know each of these families so you can help the questioner recognize their special qualities when any of these cards come up in a reading. If one of these cards comes up in a reading, it may show what the questioner has been trying, or wishes to try, to earn a living. These cards may help questioners understand the nature of their emotional burdens. Many of these cards have positive indications as well, so learn the cards to offer positive suggestions for questioners who appear to be stuck in one of these ruts. These cards may help questioners understand how their suffering began. All the images on the cards are symbolic, and symbols speak directly to your subconscious mind. Therefore, you can use these cards to feed your mind with positive ideas in the form of pictures. Meditating on these images will inspire your subconscious mind to create more joyful situations automatically without using verbal affirmations. You can make the meditation even more powerful if you align your mood and feelings to the cards as you contemplate them. Draw in the details of the characters, scenery, colors, and feel the overall mood of each picture. Memorize these feelings until you can invoke them in your conscious mind at will. For best results, avoid any feelings of inadequacy, despair, jealousy, resentment, or other negativity that might confuse your message to your subconscious mind. Keeping positive images fresh in your memory acts like a magnet to bring more positive situations and opportunities into your life. Nori Muster is an art therapy researcher, with a Master of Science degree in Interdisciplinary Studies from Western Oregon University. She has lived in Arizona, since 1970, and has used the tarot and iChing for mind-body-spirit healing since the 1960s. She is the author of Dreaming Peace: The History of Positive Thinking, and other books. Her website is Surrealist.org.